With the help of this Magento 2 partial payment extension, you can create different payment plans allowing customers to subscribe for all cart products at once but pay for the selected items partly. This can be a strong B2B feature, but it is also possible to use MageDelight Partial Payment Magento 2 module for retail clients. Imagine a situation when a store visitor wants to buy something but he or she lacks the necessary amount of money. 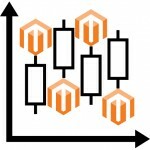 In case of default Magento 2, you lose a client, but with the MageDelight Partial Payment Magento 2 module, you get a chance to turn this visitor into a buyer by allowing to split the price into several payments. As a store owner, you can set the initial amount and assign fees for each installment (further payment). Looks quite useful, so below we shed light on the extension’s core features and describe its backend and frontend. 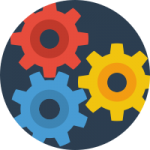 Smart & rest free auto capture payment engine (no cron job is required). 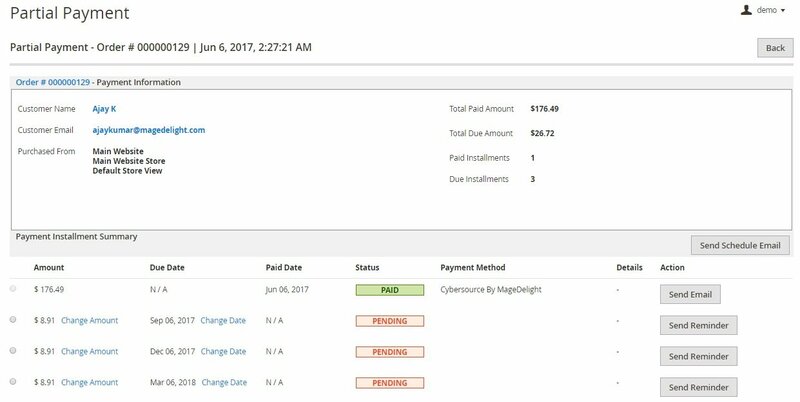 The first and the most important feature of the MageDelight Partial Payment Magento 2 module is the ability to reschedule specific installment. 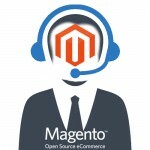 This Magento partial payment extension allows you to fully leverage individual approach to customers. Whether it is B2B or B2C, you can easily assign a new date for selected installment increasing customer loyalty. The feature is available in the backend interface and we will illustrate it in the appropriate section of this review. Also note that instalments can be used in case of the whole cart. If certain products do not support partial payments, your customers can still get them using this algorithm by purchasing several product together. 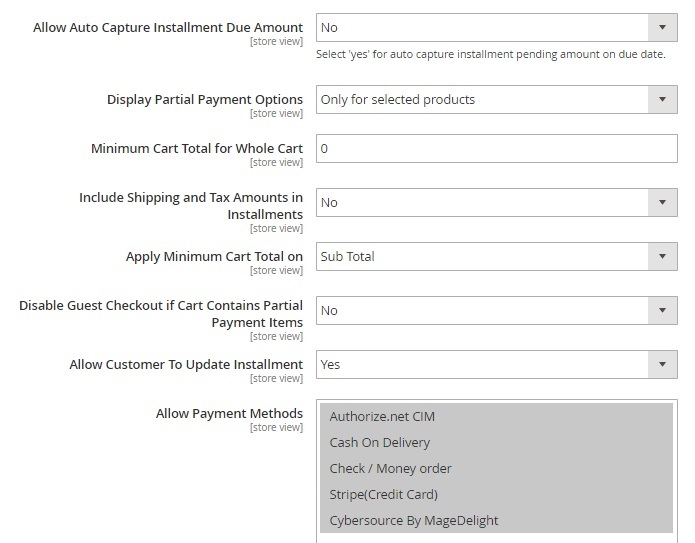 And if a customer makes payment through money order, cash on delivery, or check, he or she can still use installments, since the Magento 2 EMI payment extension by MageDelight allows your admins to make payment of an installment from the admin interface. Thus, partial payments are possible despite the selected payment method. And note that the information about installments is displayed in a cart. The MageDelight Partial Payment Magento 2 module shows the amount that a customer should pay during the checkout and the amount to be paid later. As mentioned above, fees and other charges are also supported by the extension. You can manage them via the backend section. It is possible to set fixed or percent rate for each numer of installments. Another very important feature is installment reminders. Specify the amount of days in advance to sent the reminder. Its frequency will be based on the frequency of payments specified. And here is the most interesting feature. The MageDelight Partial Payment Magento 2 extension fully supports customer groups. It means that you can make the extension functionality available for wholesale clients only, turning the module into a robust B2B tool. Also note that the remainder of the amount can be paid faster, so customers are able to save on the interest charges. But what about the backend interface of the module and its configuration? To configure the MageDelight Partial Payment Magento 2 module, go to Stores -> Settings -> Configuration -> MageDelight -> Partial Payment. All the settings are divided between two sections: General and Installments Email Configuration. The first section allows you to enable partial payments on the frontend. Set the appropriate option to “Yes”. Next, specify the type of the initial payment amount. It can be a fixed amount or a percent. Set the initial payment amount. The frequency of payments can be weekly, monthly, or quarterly. Next, this Magento 2 partial payment extension allows you to specify the amount of installments as well as additional fees for them. Note that there are two fee types: Fixed and Percentage. 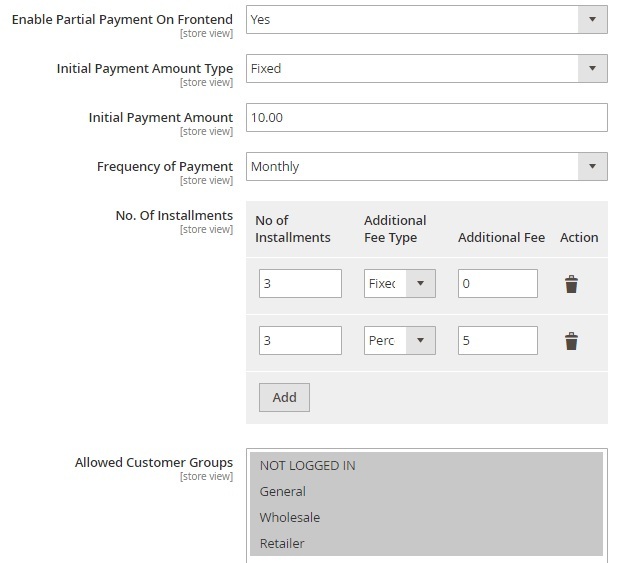 In Allowed Customer Groups, you can make the MageDelight Partial Payment Magento 2 extension B2B-specific by selecting wholesalers as the only customer group with the ability to use partial payment. Next, enable auto capture installment pending amount on due date and choose where to display partial payment options: only for selected products, for all products, or for whole cart. Note that it is possible to specify a minimum cart total for the “whole cart” option. Besides, the module allows to include/exclude shipping and tax amounts in installments. And you can enable/disable guest checkout if a cart contains partial payment items. Installment can be updated by customers. In order to activate this feature, set the appropriate option to “Yes”. The last thing that can be configured in the General section is the selection of allowed payment methods. 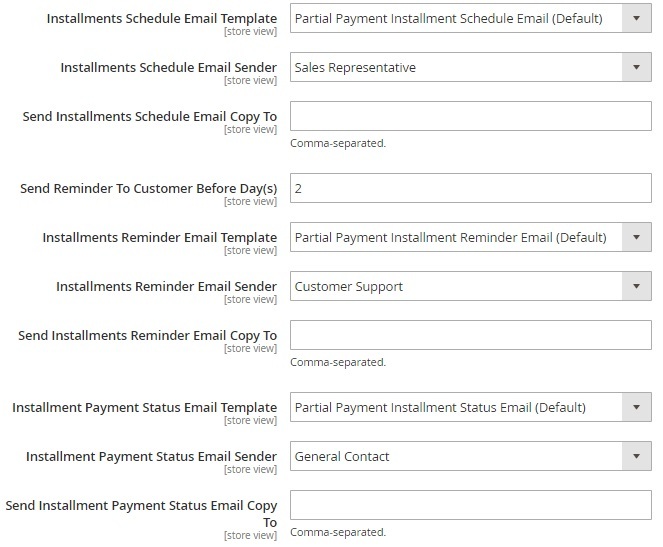 In Installments Email Configuration, you can choose templates and specify sender contacts for various notifications. All partial payments are available in a grid under Partial Payments -> Installment Summary. The grid displays such details as order number, store view, customer name and email, paid and due amount, as well as paid and due installments. Next, you can change the amount and date of each installment as well as send reminders and view details of paid installments. The next section allows to select a payment method and make a payment via the backend section manually. Now, let’s figure out how to apply partial payment to a product. Go to Products -> Inventory -> Catalog -> Select Product -> Partial Payment Information -> Partial Payment Configuration. Enable the feature, set an initial payment amount, and specify the amount of installments as well as additional fees. Note that it is possible to use config settings for both options. As for reports, they are available under Reports -> Partial Payments -> Installment Reports. Specify filter parameters and see a grid with all partial payments. While on a product page of a partial payment item, tick “Pay Now $10.00 and rest with easy installments”. Next, select the amount of installments. Note that the MageDelight Partial Payment Magento 2 module displays new total price including fees paid for each installment, so your store visitors will be always informed about higher price they should. On a shopping cart page, two new options are displayed: Amount Paying Now and Amount To Be Paid Later. 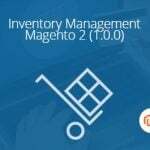 Both are self explanatory and illustrate the core principle behind the Magento order partial payment module. As for a customer account, you can manage scheduled payments under the Pending Installments tab. There is a grid there that displays order number, paid and due amount, paid and due installments, and last payment date. Besides, you can view summary of each partial order. Installment summary for each order shows the amount of each installment, due and paid dates, and status. If you want to fully leverage installments, layaway plans, or EMI payments on your Magento 2 website, pay attention to the MageDelight Partial Payment Magento 2 module. This tool provides all the necessary features allowing your customers to split order total into several parts and pay on schedule. As a store owner, you can earn more by applying fees for each installments, while customers get the flexibility of new payment algorithm. The MageDelight’s Magento 2 partial payment extension costs $399, but this is a completely reasonable price due to several reasons: you don’t have this functionality in Magento 2, but your customers want it; the module offers a user friendly interface for both customers and administrators, so the new features can be seamlessly leveraged. Follow the link below for more information.